Your belongings are important to you, and choosing a self storage facility is an important decision. Blue Mound 287 Self Storage in Haslet, TX is proud of our secure storage facilities and friendly and courteous staff. Give us a call today at (817)439-1485 to reserve your self storage unit in the North Fort Worth area! It’s important to be able to access your self storage unit on your schedule, rather than the schedule of the storage facility. A good storage facility has hours that make access easy for tenants. Blue Mound Self Storage is accessible 24 hours a day, seven days a week. A good self storage facility works to protect your valuable from theft or vandalism. At Blue Mound Self Storage, we have a video surveillance system with cameras at the gate and throughout the facility. We also have disc locks, which disarm the alarm on your unit when you enter the gate and rearm the alarm when you leave your self storage unit. The friendliness of the staff is an important consideration when choosing a self storage facility. At Blue Mound Self Storage, our staff members are courteous and happy to answer questions or help you in any way they can. When you choose a self storage unit provider, it’s important that the facility is well maintained. Blue Mound Self Storage in Haslet is proud of our clean, well lighted facility. Our entire facility is fully fenced for added security, and our aisles are wide enough to comfortably maneuver a moving van or large truck. We have cheap self storage, and you definitely end up getting a lot more than what you pay for. Storage is not a one-size-fits-all business. Your unique storage needs mean that a variety of self storage units need to be available. Blue Mound Self Storage has units from 5 x 5 feet all the way up to 12 x 100 feet. Check out our full range of self storage units, and make us your number place for cheap storage space and cheap storage units. The location of your self storage unit needs to be convenient. Blue Mound Self Storage is located in the Alliance Corridor, easily accessible by the residents of Haslet, Keller, Saginaw, and many other communities. 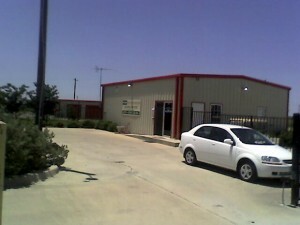 We are your number one choice for North Fort Worth storage units. Remember to always choose Blue Mound Self Storage for your boat storage, RV storage, and other storage needs. Email or give us a call today at (817)439-1485!